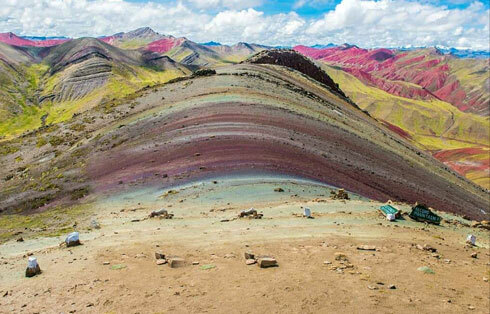 Palcoyo Rainbow mountain is a truly remarkable sight which will take your breath away. The mountain is striped with colors ranging from turquoise to lavender to maroon and gold. The different coloration is due to different environmental conditions and mineralogy when the sediment was originally deposited and subsequently diagenetically altered. Is not easy to get there, but you will not want to leave. Will Pick up at 7:30 am from your hotel then we start our great journey of 3:30 hours by car towards the hills of Ausangate mountain. Upon our arrival at this point we will begin to prepare for a 25 minutes of walking to the Palcoyo Rainbow mountain full of different colors, during the way we will appreciate beautiful rocks formations, until we reach the visible point of the mountain of Colors, where we will enjoy the beautiful view, At this point our guide will give share with you some information of our culture and you’ll feel the connection with the Earth, after the tour we have a small lunch and then way back to Cusco city, arriving approximately 5:00 pm.